Terrifically modern, the Enna Wicker Dining Side Chair is an excellent addition to our vast array of outdoor wicker dining chairs. The Enna range, including an arm chair, features a predominantly equilateral design with slightly flared back and base, on a powder coated aluminium frame and tasteful Viro® outdoor wicker in fine weave, and topped with a Sunbrella® cushion as shown. 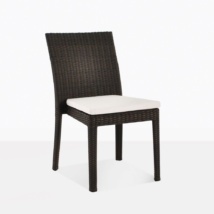 The Enna Wicker Dining Side Chair is built on a powder-coated aluminium frame – a great material for no corrosion, wrapped with Viro® wicker, you can trust that this chair will last for a long time in the great outdoors with little maintenance, ready for you each time you wish to dine and relax! W19.5" x D24" x H33"
Viro® is a celebrated brand of wicker, popular because the company is not only environmentally conscious, but it makes this epic, strong polyethylene synthetic, that is UV treated so it won’t morph, discolor or break in extreme temperatures. 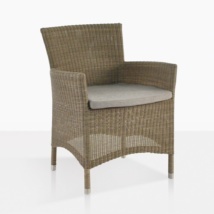 Viro® wicker is recognized for its excellent durability while being an attractive product to place in or outdoors. 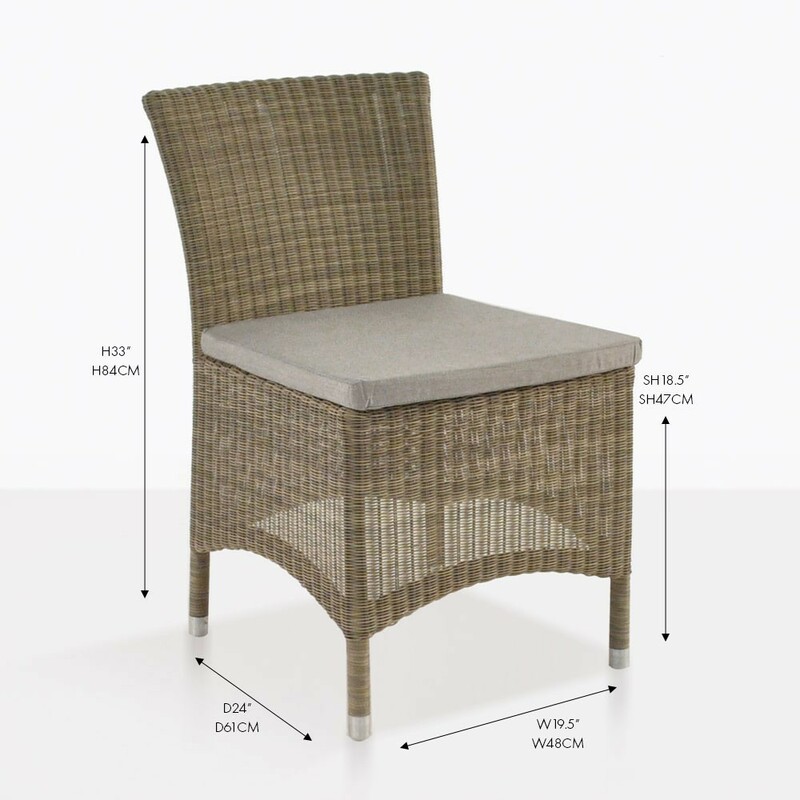 With the finishing touch of a Sunbrella® cushion, you will be thrilled with the results of an Enna Wicker Dining Side Chair. 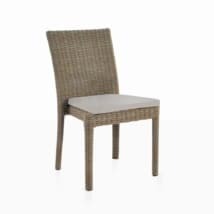 These Enna Wicker Dining Side Chairs look superb around a long 117” table or paired up with one of our smaller café tables. Experiment with grandeur by creating a stunning, elongated, and contemporary display with a 117” Raw Concrete and Trestle Table, an Enna Arm Chair at either end, and 5 Enna Wicker Dining Side Chairs on each side, perfect for long family meals in a setting you will be proud to call your own. If you’re looking for a more modest look to suit your space, try a small A-Grade Teak Café Table with 4 Enna Wicker Dining Side Chairs around it; a comfortable spot to enjoy weekend brunches or afternoon snacks. 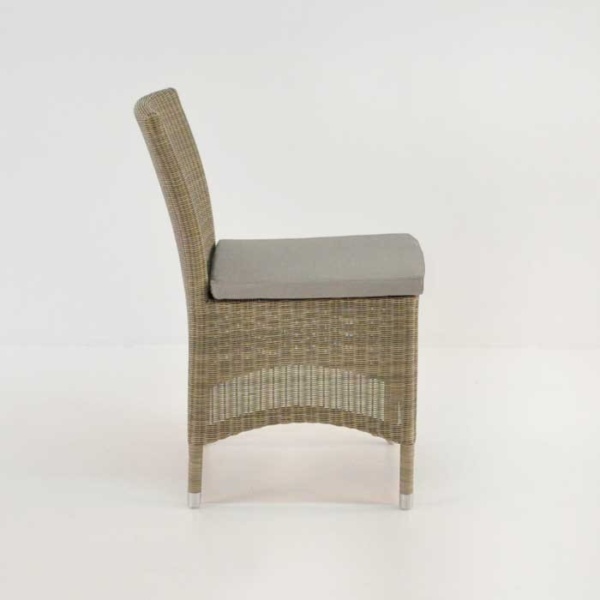 Our clients have often chosen this attractive wicker dining chair as an indoor chair as well! Use around your kitchen dining table for a practical and stylish solution to regular casual dining chairs. Have a lush garden full of beautiful greenery in need of a dining set that doesn’t take away from the stunning natural setting? Start with a very simple, picnic style A-Grade Teak table and line the sides with these beautiful, chic chairs – a Arm Chair will finish off the look and you have a classic, elegant set up that slots in well with your space! 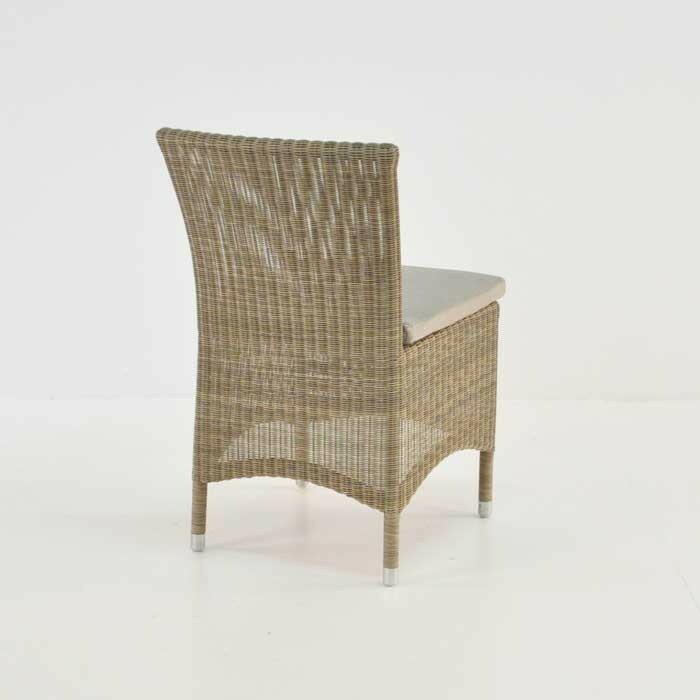 The Enna Wicker Dining Side Chairs are made from top quality outdoor products, so you know you are purchasing a luxury item that will stand the test of time. We know this to be true, we have been operating for over 20 years and we take great pride in the marine quality items for sale at wholesale prices! Teak Warehouse is open 7 days a week and our sales assistants are on hand to help you with all your outdoor furniture needs. We are available via phone, email or in store! The Enna Wicker Dining Side Chair is a beautiful choice for use indoors or out. Sleek and stylish, this is a chair you will be proud to own.